Foto subida el 10/7/17, Sí, te requetequiero! 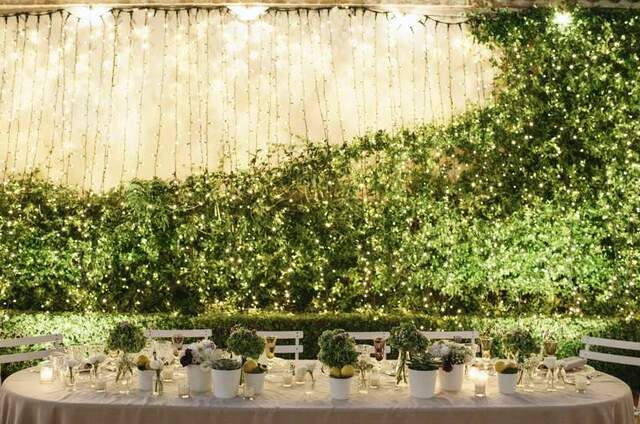 De su pasión por las bodas nace de la mano de Nuria y David, Sí, te requetequiero!, un proyecto a través del cual buscan que todas las parejas sientan en ese día tan especial que todo saldrá perfecto. Todas las parejas se merecen una boda inolvidable y ellos se encargarán de diseñarla y hacerla realidad. Entre sus servicios podréis encontrar la decoración, la organización y el asesoramiento, para que sean cuales sean vuestras necesidades, encontréis en ellos lo que buscáis. 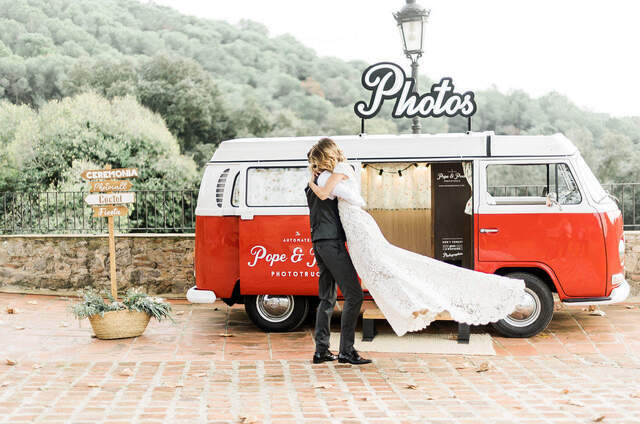 Saben de primera mano los nervios que se sienten con la preparación y la organización, por lo que conseguirán que no tengáis que preocuparos por nada y disfrutéis del maravilloso día de vuestra boda. Contactamos a muchos proveedores, pero tuvimos un feeling con Nuria y David. No podemos estar mas contentos con Nuria y David... Nuestra pareja perfecta... Sin duda fue la mejor elección que hacemos sobre esta boda ! La perfección en cada punto (decoración, design, comunicación, logística...) Un trabajo increíble ! Gracias a ellos hicemos una boda de sueño... Son grandes profesionales y mas que eso tienen un corazón muy grande. Ademas de todo eso, es una organización y un trabajo real de Nuria y David con grupo watsap, skype, email, documentos EXCEL, PDF de inspiraciones, cuenta de Pinterest y mas... Todo está realmente bien hecho con profesionalismo y amabilidad. Gracias a ellos, disfrutamos cada segundo de nuestra boda. Estuvieron a cargo de todo durante el día y ¡qué día tan maravilloso! Nuria y David son gente que no nos vamos a olvidar. Sobre todo mil gracias ! We contacted many suppliers, but we had a feeling with Nuria and David. We understood each other immediately. We can not be happier with Nuria and David ... Our perfect couple... It was the best choice we made for this wedding! The perfection in every point (decoration, design, communication...) An incredible job! Thanks to them we made a wedding of our dreams ... They are great professionals and more than that they have a very big heart. In addition, it is an organization and a real work of Nuria and David with watsap's group, skype, email, EXCEL's doccuments, PDF of inspirations, Pinterest account and more ... Everything is really well done with professionalism and kindness. Thanks to them we enjoyed each second of our wedding, they were in charge of all during the day, and what an amazing day! Nuria and David are people that we will not forget. Thanks a lot for all you did ! Nous avons contacté de nombreux prestataires, mais nous avons tout de suite eu un feeling avec Nuria et David. Nous nous sommes compris immédiatement. Nous avions beaucoup d'envies et pour eux rien n'était impossible! Trouver un endroit magnifique avec des chambres et des salles de bains pour chaque invités ou avoir un spectacle de chevaux accompagné d'une danseuse de flamenco ou encore encore avoir une guitare gitane et un violon pour la cérémonie dans l'église... Bref tout est possible avec eux. Nous ne pouvons pas être plus heureux avec Nuria et David ... Notre couple parfait ... C'était sans aucun doute le meilleur choix que nous avons fait pour ce mariage! La perfection dans chaque point (décoration, design, communication ...) Un travail incroyable! Grâce à eux, nous avons fait un mariage de rêve ... Ce sont de grands professionnels et plus encore, ils ont un très grand cœur. De plus, c'est une organisation et un vrai travail de Nuria et David avec: groupe watsap, skype, email, documents EXCEL, PDF d'inspirations, compte Pinterest et bien plus ... Tout est vraiment bien fait avec professionnalisme, gentillesse et bien veillance. Grâce à eux nous avons apprécié chaque seconde du jour J, ils étaient en charge de tout au cours de la journée et quelle merveilleuse journée! Nuria et David sont des gens que nous n'oublierons jamais. We cannot recommend Nuria and David highly enough. They are so talented at what they do, but more than this, they are such special people. We are from Scotland and chose Barcelona as our wedding destination. We decided to find a wedding planner to help organise the day, since we live out of the country and have difficulty with the language. We spoke with a few different planners, but after our first Skype call with Nuria and David we immediately felt a special connection and our minds were made up. Their warmth and passion was clear. They did not disappoint. They set up a whatsapp group chat with us immediately and were in almost daily contact with us. 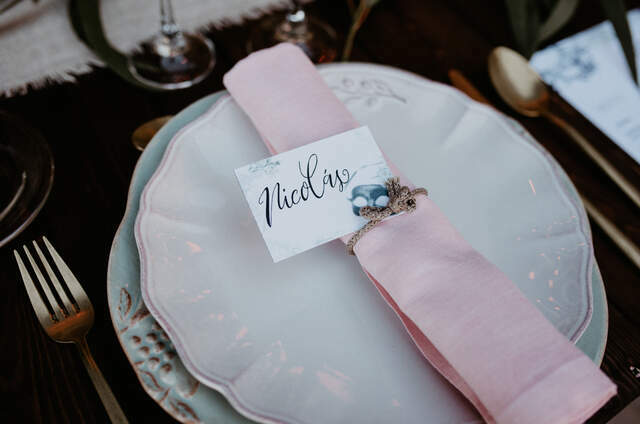 They immediately understood the kind of wedding we wanted and worked closely with us to develop our ideas, adding to this with their own creativity and expertise. 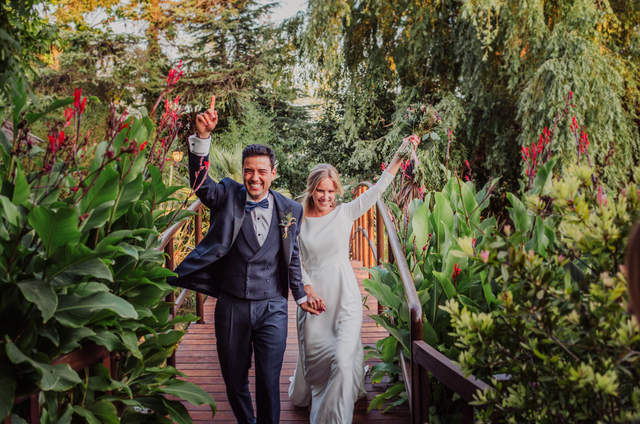 They guided us through the full process, giving advice and imparting their wealth of experience and knowledge, but also allowed us freedom to decide on exactly what we wanted on our special day. 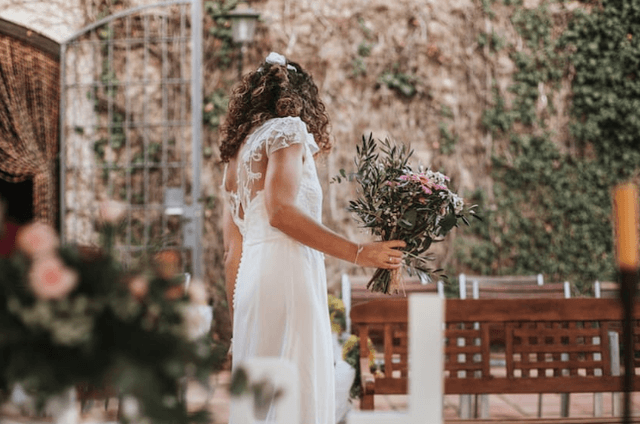 Nuria and David handled all of the suppliers for us, alleviating any sources of stress for us through the full organisation and on the day itself. They made the whole process fun and exciting. We were working with a fairly strict budget too. Nuria and David were always mindful of this and worked so hard to make sure we could have what we wanted while keeping costs affordable and within our budget. Their creative and artistic style is absolutely outstanding. The decoration of the venue which they put together, the signs they made by hand, all of the small details really made the day special and unique. Our guests were blown away by it all, none of them had experienced a wedding like it. They gave us the exact wedding we had dreamed of from the beginning. In fact, even better!!! 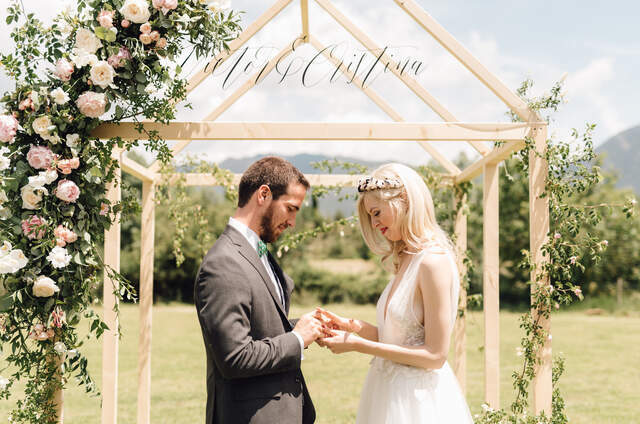 Nuria and David went above and beyond all of our expectations of what a wedding planner would provide. Nothing was too much for them and they will stop at nothing to make sure your day is as amazing as possible. They are such warm, caring people, and they truly appreciate how important their job is for their clients. No podemos estar mas contentos con Nuria y con David: una vez nos prometimos, encontramos a los proveedores uno tras otro buscando por Instagram, por webs y recomendaciones... Pero una vez crees que lo tienes todo, toca organizarlo y diseñarlo!! Nosotros vivimos fuera asi que no dudamos por un segundo el contratar a un wedding planner. Solo contactamos con 3 empresas y Si, Te Requetequiero nos requetencantaron! Hablamos con ellos en seguida y nos captaron al instante. Cuando nos pasaban propuestas no sabias que descartar, lo queriamos todo! Hacen pdfs para que puedas visualizar todo y tenian nuestra idea tan clara y tan bien diseñada que escoger materiales fue facilisimo. Se entendian con todos los proveedores, vienen contigo a todas partes, estan contigo 24/7, para cualquier cosa! PARA TODO! Y no solo eso: hacen ellos mismos los detalles, el DIY lo llevan por la mano, diseñan todo lo que necesites y mas! Y cuidan con tanto mimo y amor hasta el mas insignificante de los detalles que luego se nota cantidad! El dia de la boda no tienes que preocuparte por nada en absoluto porque lo tienen taaaan interiorizado... Mucho mas que tu mismo incluso! Son increibles, son los mejores y nos casariamos mil veces mas y los contratariamos todas ellas! Estan a la altura de superman para nosotros! :) Son unicos y se merecen todo el exito del mundo! GRACIAS POR TODO CHICOS!!!!!!!!!!!! Cuando decidimos la fecha de nuestra boda, sabíamos que con solo 5 meses estabamos contra el tiempo y más aún viviendo lejos del sitio en donde celebraríamos ese día tan especial. Para esta tarea confiamos plenamente en Núria y David, los cuales nos dieron una gran tranquilidad y apoyo en cada detalle de la organización. Cuentan con una gran flexibilidad, creatividad y un círculo de colaboradores que se complementan perfectamente. Principalmente queremos destacar de Núria y David su trato cercano, disponibilidad para resolver dudas y su buen gusto, que quedo reflejado en el día de nuestra boda. Muchísimas gracias y el mejor de los éxitos. When we decided the date for our wedding day we knew that with just five month to go it was really tight to organize it all - especially living far from the place of the celebration. For this task we trusted fully in Nuria and David who gave us a lot of peace of mind and support in each step of organizing the wedding. They are very flexible, creative and have a big network of suppliers who complement each other perfectly. 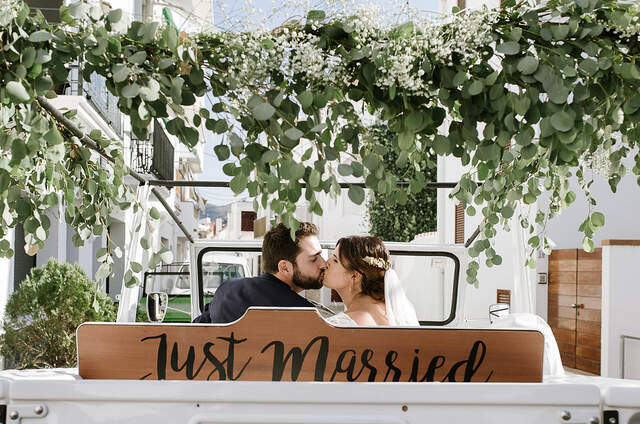 We would like to highlight that Nuria and David have a very personal approach, always available to resolve doubts and their excellent taste was reflected in the beauty of our wedding celebration. Many many thanks and all the best for the future! We are so lucky to have found Sí, te requetequiero! We reached out to a few Wedding Planners, but we chose to go with Sí, te requetequiero! because of their immediate response to our emails, their immediate helpfulness and willingness to communicate with us in English. We are a mixed couple, where the bride is English and the groom is Spanish. They became very useful to us especially as we do not live in Barcelona, but in Hong Kong. They were literally an extension of ourselves and helped us visit all the suppliers, communicate with our family in Spain and pay the vendors. Your really feel that they are there to help you. And they do everything with such politeness and happiness. Evereything was very easy and effecient. 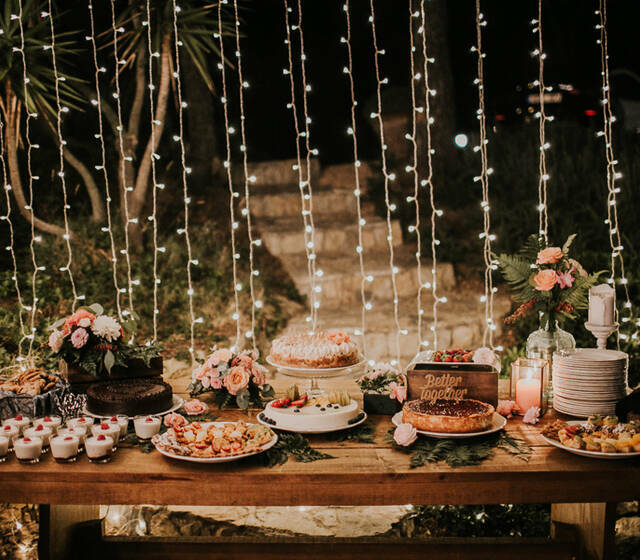 We are beyond happy with how our wedding looked, tasted and sounded! It was truly the wedding of our dreams and the day was coordinated perfectly! WeI highly recommend using them if you are living locally, but more so if you are living abroad and need someone that you can really rely on to do things for you promptly and efficiently. My husband and I are both designers and both had a specific vision we wanted for our wedding. Sí, te requetequiero! really understood our style and vision and that was also really important to us. They were so helpful to make the design and atmosphere exactly how we wanted it. Everything felt possible with them. 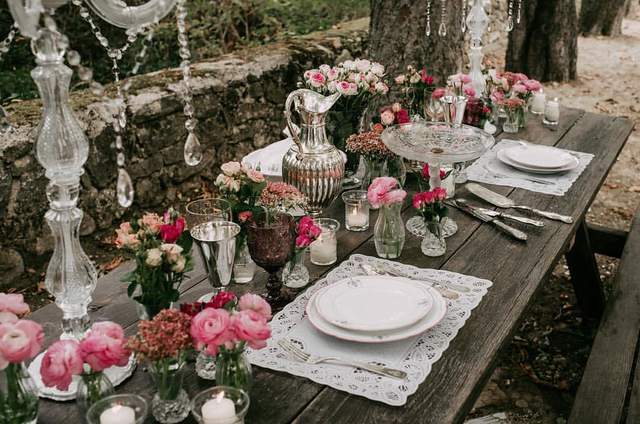 ¿Quieres saber cómo sería una boda en primavera celebrada en mitad del bosque? ¡Te la enseñamos con esta sesión tan original! 13 pensamientos negativos que toda novia tiene al organizar su boda: ¡fuera! Descubre cuáles son aquellas ideas que se te tienen que ir de la cabeza ¡YA! en la organización de tu boda.